This is Summer, the third and completing member of this family. Her mom was looking for a newborn photographer in Connecticut a few weeks before she arrived and a good friend told her all about me. We hit it off and I knew her family would be a perfect fit for the video that you see on my home page. So after a little bout with jaundice and some time under the lights, Summer and her family came to see me when she was 3 weeks old. Wide awake at the beginning! Summer is so lucky to grow up with these two as siblings. They were so kind and gentle with her. Once she drifted off to sleep, Summer was super happy to have some tummy time on this beautiful floral blanket. Here’s hoping Summer grows up to look just like her mom! Such a gorgeous lady inside and out. Summer was so strong she kept busting out of my swaddles. And if you’ve ever seen me swaddle a baby, you know that takes Herculean strength! But once she got that top leg out and was settled into this little bed, she just sighed and went back to dreaming. Summer’s big sister was so good with her and kept her safe and sound while she slumbered. Mom really wanted a photograph of her two girls sharing some time together. All tucked in and resting in this floral heart wreath, Summer raised her eyebrows right as I took the photo. She must have been having an interesting dream. We were all giggling when Daddy got his turn to take photos with Summer. She kept making the cutest noises and here she was giving us the “popeye” wink. Sleeping in her bed with roses, Summer looks so delicate and lovely. And here they are all together, this new family of five! Congratulations on your new baby girl. I had the best time working with all of you. 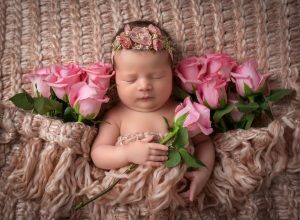 If you would like to see the video that we made during Summer’s newborn photo session, visit my homepage and scroll down. It’s less than 2 minutes long and gives you a glimpse into what a newborn session with me is like.